Chavistas constantly acuse the press of treating their guy unfairly. They’re not always wrong. 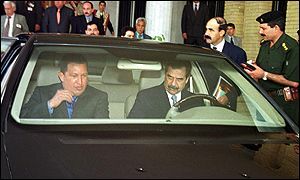 But last night’s little sound-bite, when Chavez lavished praise on the stomach-churningly violent dictator of Zimbabwe, confirms what we’ve known all along: the most damaging of the media “hits” on Chavez are always self-inflicted. I could add 20 more links if I spent 20 more minutes on it…Mugabe’s Google trail as a mass-scale human rights abuser is long and deep, so I just picked out stories from the last few of months or so. 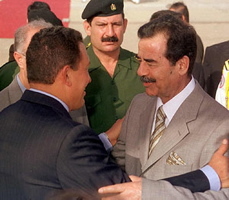 Though at least Chavez had the good sense not to praise Saddam personally. 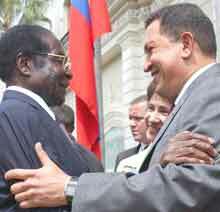 CARACAS (AP)–Venezuelan President Hugo Chavez praised Zimbabwe’s embattled President Robert Mugabe as a “freedom fighter,” bestowing the visiting African leader with a replica of South American independence hero Simon Bolivar’s sword. “I give you a replica of liberator Simon Bolivar’s sword,” Chavez said Thursday after the two leaders signed an energy cooperation agreement.